Commercial high ammonia (HA-NRL), low ammonia (LA-NRL), deproteinised (DP-NRL) and prevulcanised (PV-NRL) natural rubber latex concentrates were characterised for their colloidal properties using particle size and distribution analysis, Scanning Electron Microscopy (SEM), zeta potential analysis and rheology measurements. Particle size analysis showed HA-NRL, LA-NRL and PV-NRL to have bimodal distributions whereas DP-NRL showed a unimodal distribution. SEM showed HA-NRL, LA-NRL and PVNRL particles to be spherical whereas DP-NRL particles were made up of a mixture of spherical and pear-like shapes. Furthermore, HA-NRL, LA-NRL and DP-NRL particles were deformed and fused together unlike PV-NRL particles which retained their spherical shape. 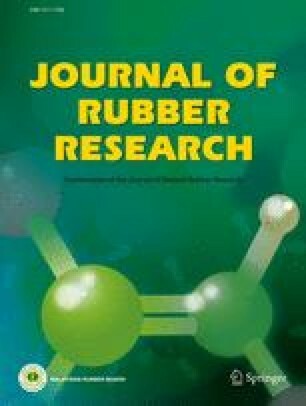 The zeta potential results indicate that all four latex concentrates follow a similar trend to the results obtained by previous researchers. Rheological studies were divided into steady state and oscillatory measurements. Shear thinning behaviour was observed for all four latex concentrates and fittings to the linearised Dougherty-Krieger equation showed HA-NRL, LA-NRL, DP-NRL and PV-NRL to have ø of 0. 787, 0.810, 0. 790 and 0.803 which corresponded to latex concentrations of 76.9 wt%, 79.2 wt%, 77.2 wt% and 78.4 wt%, respectively. Oscillatory measurements at a frequency of I Hz and ø = 0.62 gave tan c5 values of 1.28, 0.52, 0.96 and 1.41, respectively for HA-NRL, LA-NRL, DP-NRL and PV-NRL indicating a dominant viscous behaviour in HA-NRL and PV-NRL while LA-NRL and DP-NRL showed dominant elastic behaviour. A shift from dominant elastic to viscous behaviour for LA-NRL and DP-NRL was observed to occur at ø of ≈0.595 and 0.60, respectively.